Orderly rows of plants painted with botanical specificity by Vittore Carpaccio (c. 1460-1526/1526 CE) were observed along the lower edges of several paintings within the cycle portraying the Legend of Saint Ursula, commissioned by the Scuola di Sant’ Orsola in Venice, Italy in the late 15th and early 16th centuries. 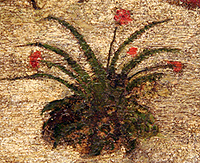 At a time when painters generally followed Cennino Cennini’s advice to “ scatter occasional flowers and little birds over the foliage” to indicate spring, these plants by Carpaccio demonstrate remarkable attention to detail, suggesting they were drawn directly from nature or influenced by the burgeoning publication of medicinal herbal manuscripts in Venice and Padua. Series of these plants are identified and connected with their known medicinal uses from medieval and ancient Roman manuscripts. Further, analysis of the compositional devices and arrangement with relation to the narrative of the painting cycle reveals a program of imagery relevant to women’s health and the treatment of various reproductive concerns throughout a woman’s life cycle. A function of the Scuola di Sant’ Orsola and Angela Merici’s establishment of the Ursuline Order within the Catholic Church included tending to the sick, particularly orphans and single women. It is suggested that this use of herbal medicine gave women of the Ursuline Order some autonomy and agency to act independently within Venetian society, in a community of healing. The maintenance of medicinal herbal gardens and simple garden pedagogy is discussed in relation to Venetian and Italian garden architecture, particularly with regards to the church complex of SS Giovanni e Paolo directly adjacent to the Scuola di Sant’ Orsola. Victoria Boardman completed her MFA in Painting and MS in Art History at Pratt in 2010. She previously earned a bachelor’s degree in Studio Arts from Trinity College in Hartford, CT. She is currently studying Chemistry at Pace University in Manhattan, pursuing a career in art conservation science. She worked for over two years as a graduate research assistant for the Math & Science department at Pratt, using portable, non-destructive spectroscopy and methodology from analytical chemistry, combined with art historical research, to study artist’s materials, techniques, and the conservation state of works of art and architecture. This research included on-site analysis of mosaics and wall paintings in the Herculaneum and Volterra, Italy, resulting in publication in the Journal of Analytical and Bioanalytical Chemistry. Vicki’s independent research in dyeing textiles with materials from nature was featured in the September 2008 Journal of Chemical Education. The 10th Annual Master’s Thesis Presentations will be held on Wednesday, April 13, 2011 at 5pm in Myrtle Hall, 4E-3.